Is this the correct way to wire a rocker switch to LED strip? A lot of what I see online is people showing SPST 3-terminal switches for this application. Can I just use a 2-terminal like the one shown in the diagram? Assuming the LED strip works with the power supply alone, adding the switch in between is fine. The third terminal on a SPDT switch provides an alternate path for the power supply, but is usually not connected in this configuration regardless. The switch used in the video youtube.com/watch?v=cQpQWFYX524 is a lighted SPST switch. It includes an LED connected between one switch terminal and the third pin, as below. 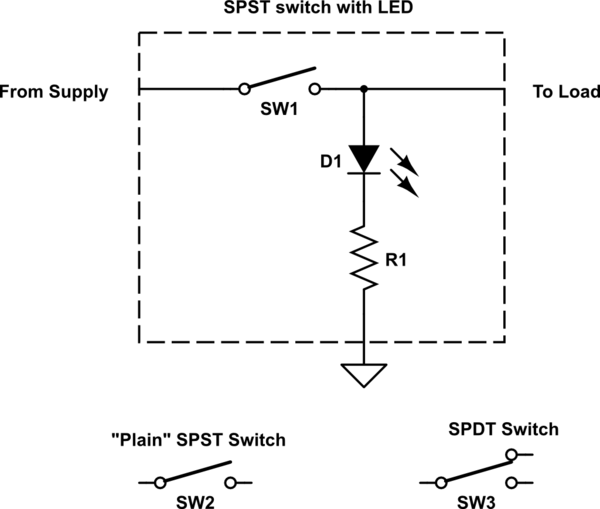 A plain SPST switch (no light) will only have two terminals. An unlighted switch with three terminals would be SPDT. Not the answer you're looking for? Browse other questions tagged led-strip toggle-switch or ask your own question. Best practice to switch +V or GND connection? How do you design a switch input to a MCU for ultra low power consumption? Which type of transistor for pulsing LED strip? Does cutting LED strips into smaller strips then wiring with low AWG decrease temperature?